Here’s how to beat Gondul the Valkyrie in God of War, one of the tougher optional fights in the entire game. God of War offers up an awesome tale of a Father and Son slowly coming to terms with their place in the world. This main story is the core focus of the game, but there’s plenty to do elsewhere. There’s Dwarven Favors, collectibles, and optional boss fights. 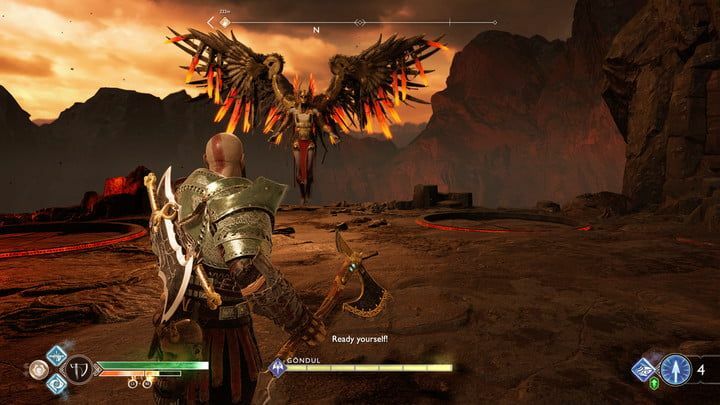 Some of these optional boss fights fall under the Valkyrie quest-line, in which Kratos must defeat a series of powerful end-game enemies, each with their own unique fighting style. The Valkyries are spread across the realms in the game, with one named Gondul located in the fiery realm of Muspelheim. Before facing Gondul, or any Valkyrie for that matter, be sure to get Kratos up to level 6, have a Berserker Resurrection Stone handy, and an armor set that favors Runic stats. We managed this fight with level 8 armor, with a health regenerating talisman. Also, assign the wolf power to Atreus’ bow. To reach Gondul, you’ll first have to clear all eight of the challenges which lead you up to the top of a mountain. Once you’ve done that, prepare yourself for a difficult fight. Gondul favors fire attacks, so grab some enchantments which protect against them. You’re mostly going to want to rely on your axe here, as frost attacks are going to inflict more damage. Once you’re ready, trigger the fight and then immediately rush her. Use both runic attacks on your axe before triggering Atreus’ wolf ability. This will keep her pinned down, giving you the opportunity to spam axe attacks until the attack wears off. Focus on dodging her attacks (be aware of her fireballs which precede dive bomb attacks), biding your time until your specials return. If you find yourself cornered, trigger Rage mode, as this will stave off damage taken giving you the chance to regroup. The key here is to play it as safe as possible because one wrong move can mean losing the fight. There is one attack which you can attack after. The dashing stab can easily be side-stepped, giving you a window in which you can land three normal axe attacks. In general, though, these brief opportunities aren’t worth it and it’s better to focus purely on Runic attacks. Keep her at a distance as much as possible and use the same attack pattern as before when you get the chance. Doing this a few times will down her, as long as you are patient. You may be tempted to use your Rage mode to finish her off, but hold off just in case. In situations like this, Rage is an insurance tactic. Hopefully, that gives you more of an idea on how to beat Gondul in God of War. Once you’ve defeated Gondul, it’s just a matter of finishing the rest off, before facing the final boss. For more tips and information, check out our review and our God of War wiki guide. Here are a few other guides, as an example, that you might want to check out.